CHICAGO (WLS) -- It may be spring, but a Secret Santa is doing some good at hospitals around the country and right here in Chicago. 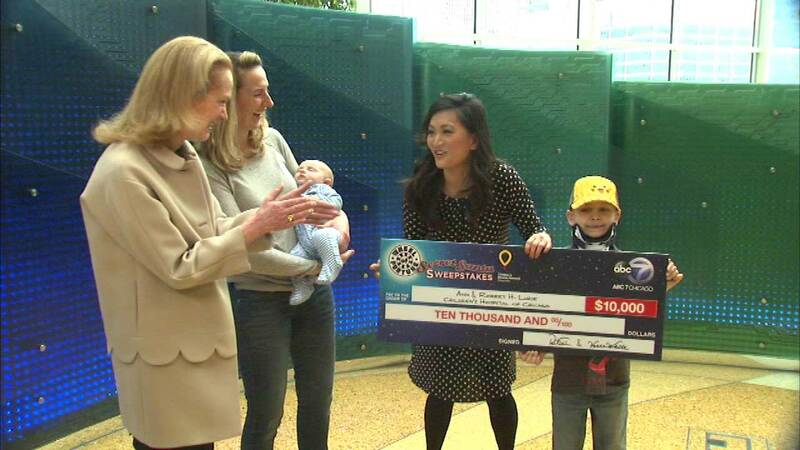 Ji Suk Yi of "Windy City Live" presented a $10,000 check Friday to Anne and Robert H. Lurie Children's Hospital on behalf of "Wheel of Fortune" and ABC7. It all started back in December during the show's Secret Santa Sweepstakes. A Romeoville, Ill., resident, who is also a Wheel Watchers Club Member, saw her spin ID revealed on the show. She won the same cash and prizes as the contestant on the show. Then, "Wheel of Fortune" matched the cash value of their winnings as a donation to her local Children's Miracle Network hospital. Close to $500,000 is being distributed to 25 Children's Miracle Network hospitals across the country, all part of the Secret Santa sweepstakes! You can watch "Wheel of Fortune" weekdays at 6:30 p.m. on ABC7.